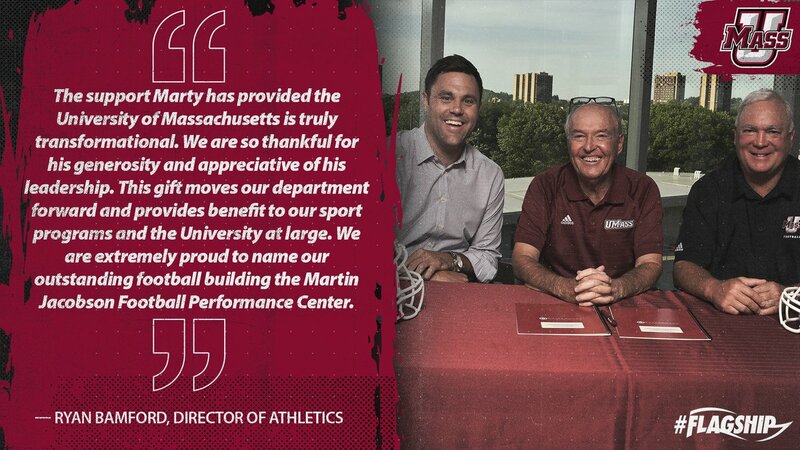 UMass Alumnus Martin Jacobson pledges $5.58 million to help fund a new practice bubble for football. The Gazette, which has not yet replaced Matty Vautour, has story about the gift and notes some of the funds will go towards a high-rez scoreboard. Mike Traini of "Fight Massachusetts" also has a post on the gift. This is good news for the football team and athletic dept. While not a hard-sided facility, it'll be functional and a big help in bad-weather Amherst. Along with the scoreboard, it's another year of improvements. UMass went decades without any sort of improvements in McGuirk and this means we're still on the way up. BC Interruption looks at the last five games between the Eagles and the Minutemen. Speaking of BC, Athlon has five Eagles as preseason All-Americans. The Lawless Republic says Independent BYU shouldn't play a schedule like UMass or Liberty. Athlon Sports ranks Georgia's 2018 opponents in order of difficulty. That's great news about the practice facility! Great news. What other team can realistically practice there? I'm thinking soccer during the winter, but track and field still needs some sort of indoor facility. This will definitely help recruiting though. Football, Men's and Women's soccer, men's and women's Lacrosse and probably field hockey would use the bubble. I'll have some more info on practice bubble's in tomorrow's blog. I know Harvard has a bubble over the field in the stadium in the winter months, and all the teams that Frank mentions make use of it to condition. At 36 billion, Harvard's endowment is (far) greater than any institution in the country, and they could surely build a permanent indoor facility with relative ease. And yet they haven't They have the money and the land. And their teams have been very competitive in the Ivy. I'm very happy for UMass and the current and future athletes. Way to go! Harvard has the Murr Center,Malkin center,a beautiful indoor Gorden Track center etc. These are all first class individual modern indoor sports facilities.Daughter was fortunate enough to use them all. Not today, but maybe some day,UMASS. I'm referring to a devoted state-of-the-art field house for football (and others). The facilities you mention are for tennis and squash at Murr, and Malkin is a recreation center. I don't know that Harvard will ever construct an indoor facility devoted to field sports because the bubble over the field at the stadium more than meets the needs of the teams. Apparently it didn't meet the needs of FBS Boston College because they just replaced their bubble with a great new IPF of solid composition and AD Bamford has recently stated that the way to go for UMass is a solid structure IPF if it could be afforded.He said a campus wide drive might accomplish that.Remember, Columbia , Harvard are FCS and don't need to have the same emphasis on football. Attended an Ivy League University where the football players were more interested in getting into medical school than their prospects for the NFL.